This past Saturday's Rally to Save the American Dream was a resounding success. People all over the nation flooded statehouses to support our public workers and stand up against tax breaks for corporations and the very rich. Along with other proud sponsors of the event (350, AFL-CIO, SEIU, MoveOn and more), we garnered the attention of none other than Glenn Beck -- making it all the way to his infamous chalkboard. We had an action packed week. The Koch brothers are buying dirty policy; the gust of support for wind power is sweeping the nation; 1.5 million green jobs are headed our way and you still have time to visit Greenpeace's matchmaking site before Valentine's Day. 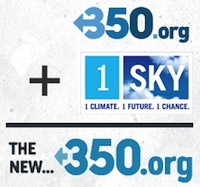 Every now and then, we here at 1Sky are invited to work together with a local climate group doing something extra special -- and we love invitations to get involved. Why do we like it? The truth is that facts and figures only get you so far in the world (and occasionally just hold you back); whereas stories not only inspire us to work harder, they also personalize the everyday battle for a safer planet. 1Sky was a proud sponsor of New Organizing Institute’s (NOI) RootsCamp that took place last weekend at George Washington University in Washington, DC. This marked the fifth anniversary of NOI’s RootsCamp "unconference", where organizers set the meeting agenda, share lessons learned, schmooze (I dislike the term “network”, but yeah, network), and drive the conversation about best practices in organizing. It's the last official day of the climate talks in Cancun, though no one expects things to end today. Negotiators have been working into the wee hours of the night and will probably continue to do so tonight, with the potential for a final deal early on Saturday. Unfortunately, it is increasingly looking like whatever deal that may result will be reached not because of U.S. The COP16 climate talks are coming to a close in Cancun, Mexico, and while we hoped countries could come together in solidarity in the face of climate disaster, (much like the Palestinian firefighters who recently came as some of the first respondents to an Israeli climate crisis) many nations - especially our own -- came up short. With just over two days left to go in at the climate talks in Cancun, the U.S. is unfortunately emerging as one of the main roadblocks to progress. Unwilling to move forward with urgency on any given issue unless other issues advance at the same pace, the U.S.'s negotiating stance is effectively stalling out the talks, to the great frustration of civil society organizations here. Yesterday, I sat in on a policy briefing of the U.S. government's plans on Reducing Emissions from Deforestation and Degradation (REDD). The four speakers included Joe Aldy, Special Assistant to the President on the Environment, Maura O'Neill of USAID, Billy Pizer, Deputy Assistant Secretary for Energy at the Department of Treasury, and Patrick Smith of USAID. The speakers presented a united front about the US's REDD+ plan, focusing on how the U.S.
As many non-profit folks have commented on at the talks, everything here comes in twos. Two official conference centers each with two buildings apiece, two unofficial civil society venues, and for better or for worse, today - two grassroots rallies for climate justice. Moon Palace, where the UN climate negotiations are taking place, looks just like what it sounds like: a sunny college campus meets Hilton Head golf club resort. Amidst somewhat bewildering lawn sculptures and manicured palm trees, high-level negotiators trek between palatial buildings with names like "Maya" and "Aztec." Not once but twice did I see the U.S. lead climate negotiator Jonathan Pershing, marked by his distinctive beard, shuffling between meetings, carrying his worn-down red canvass bag.